Are you training for the Marathon and you need a special Marathon Calendar of 2017? This calendar is specially made to keep track of the next marathon you are training for. 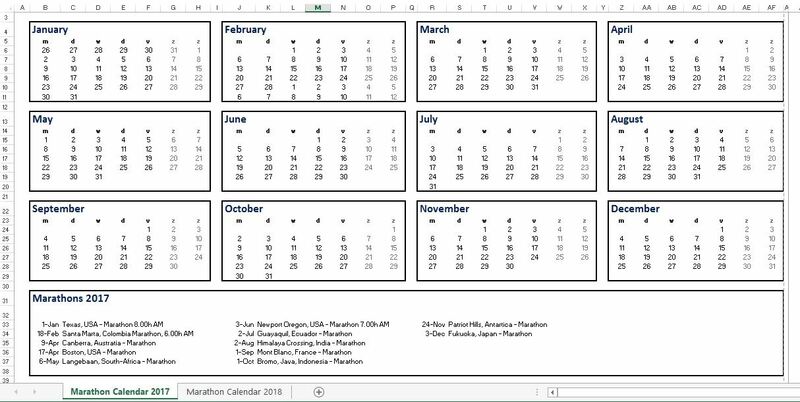 Download this Marathon Calendar 201 as Excel template now! In order to plan your next 26.219 miles (or 26 miles 385 yards) long-distance marathon race, we provide you this calendar to make sure you will not miss out on the upcoming marathon events! This Marathon calendar 2017 is suitable for beginners and pro's and aims to bring you joy towards the upcoming planned running events or activities. These tips and best practices are written for those who wants to succeed in finishing a half or full marathon! if you are a pro or amateur, this information is suitable for you!